﻿Gamma Phi Beta was founded at Syracuse University on November 11, 1874 by Frances E. Haven, E. Adeline Curtis, Mary A. Bingham, and Helen M. Dodge. Epsilon chapter at Northwestern University was the fifth chapter colonized nationally. Since its founding, Gamma Phi Beta has grown to be 170,000 members strong in 172 chapter in both the United States and Canada and over 170 alumni groups globally. Famous alumnae of Epsilon chapter include actresses Cloris Leachman, Mary Beth Peil, and Hope Summers along with politician Jocelyn Burdick. As an original chapter at Northwestern University, Epsilon is proud to be a part of the Panhellenic Association along with the eleven other sororities on the council. Each of Northwestern's twelve Panhellenic chapters work with the Interfraternity Council, consisting of fifteen fraternity chapter, the Multicultural Greek Council, consisting of 6 culturally based fraternities and sororities, and the National Panhellenic Council, consisting of seven historically black fraternities and sororities. 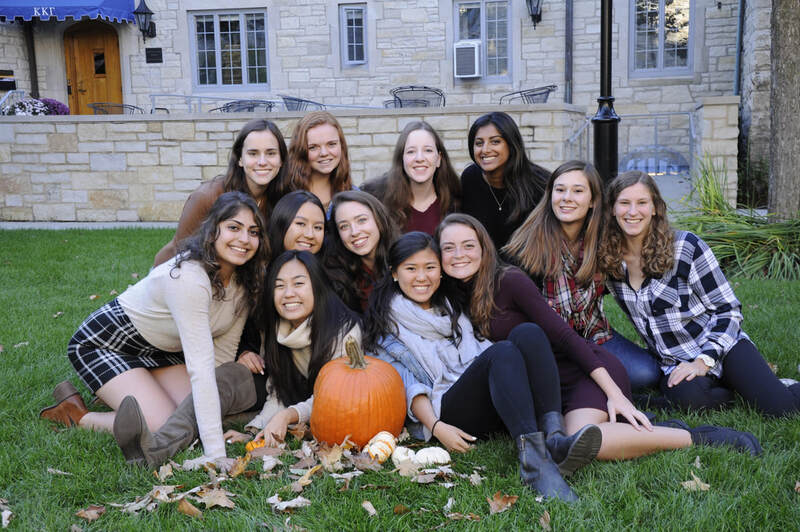 Our Greek community constitutes about forty percent of the undergraduate population at Northwestern, raises around 325,000 for charity and volunteers 37,500 hours annually﻿.